Fluorescent illumination is perfect for tracing, opaquing, stripping, and transparency and slide viewing and sorting. The surface stays cool. 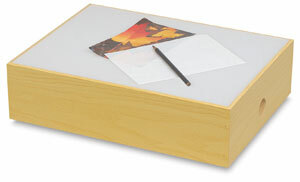 Litebox features durable, lightweight construction, a laminated particle board frame, and a frosted acrylic top.